Bob & Judy of Yadkinville, NC contacted BsnTech Networks a week ago to ask about website design services. 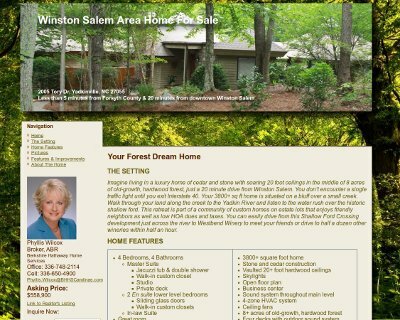 They wanted to find out if it would be worth the investment with creating a website to help aid them in selling of their home in Yadkinville, NC. After answering many questions that Bob & Judy had about the website design process along with all that was involved, we got to work on the website right away. They wanted to have the website done very quickly so they could also see about using AdWords to help advertise their website and get it listed higher in the search engines. Bob & Judy’s goal is to have an offer on the home before Thanksgiving. BsnTech Networks delivered. In less than a week, we completed the website design that helps showcase the home. It lists features of the home, a slideshow of photos, and sets the home in a setting to make it more interesting to potential home buyers. In addition, a contact form was added right on the website to help potential buyers fill out an inquiry right on the website. Bob & Judy were very pleased with the efficiency that BsnTech Networks provided and the quality of the website delivered. We appreciate the business from Bob & Judy and look forward to helping them out with their AdWords campaign! The website is at winstonsalemluxuryhomes.com.